This may be a long shot. But looks like that error message is specific to Google Chrome. I found this link on Google Chrome forum. It may be due to how Chrome is transferring content (in chunks) - see the response header for Chrome. I would try to use Firefox to view that page. AMPERE wrote: This may be a long shot. But looks like that error message is specific to Google Chrome. Thanks. But I tried all browsers, and had similar results with them all (outer frames work, but no content). Have you tried using a different computer? Borrow a laptop from a friend and connect the laptop to the ooma's home port and type the setup.ooma.com address. I also tried modem > router > ooma > laptop (laptop connected to Home port, no router). Same issue!! The strange thing is that the Hub and Scout work fine...I just can't access the Setup. I'll have to try with my work laptop tomorrow. Is your java and flash updated? I would update both just to make sure there isn't an issue with either. That is an odd situation. WayneDsr wrote: Is your java and flash updated? Yeah...made sure of that too. Thanks though. 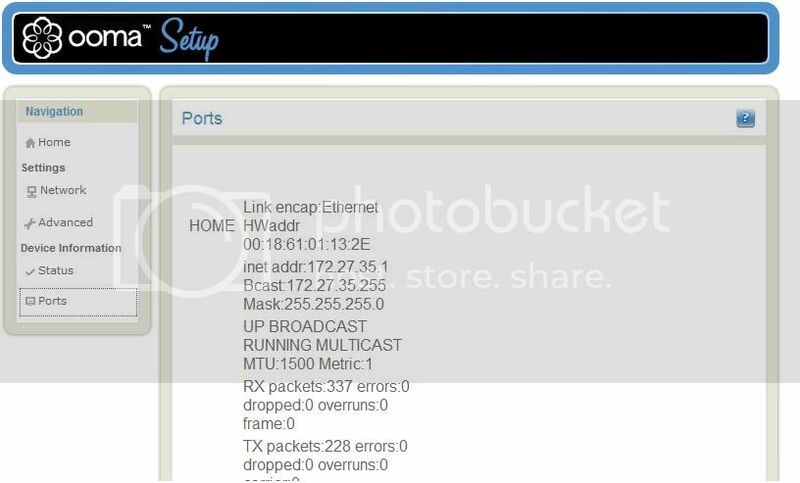 All other web interfaces work well (e.g., my setup pages for all of my routers and gaming adapters). I wonder if my Hub has some sort of production issue (bad linux distro or something). I'll try with my work laptop tomorrow. Try reseting your ooma hub. This will restore back to the defaults. This is a really curious issue. Good suggestion. Do a hard reset and use a different laptop. May need a firmware update. Keep us posted! If you do not have an IP in this address range you will never connect to the OOMA hub. Make sure your ethernet connection is connected to the port marked HOME. This is all Just very basic networking skills. Mike1 wrote: This is all Just very basic networking skills. I dont think its that easy considering he can access the page. He has the correct IP and can connect to setup. The problem is he cannot change the settings within it. This has nothing to do with networking.